We have just been informed that Cath Kidston are offering Free Delivery on orders above £50 to celebrate the launch of their new collection. Now is a good time a have a look at their latest cotton fabric patterns and buy your favourite printed fabric to make your doorstops, cushion covers, shopping bags or lavender sachets. We also love the Cath Kidston oilcloth around here and since we have started writing about shopping bags, we have found you the following instructions on Prudent Baby, to make the perfect tote bag . 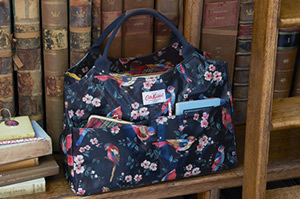 For full instructions with images, please visit: http://www.prudentbaby.com/2010/10/oilcloth-tote-tutorial.html. You can use ½ yard oilcloth or canvas. You can also use something lighter like cotton but you should line the bag and add interfacing. Don’t forget that floral fabric prints complement well with stripe fabric patterns so you could use stripe oilcloth for the bottom of your tote bag and floral printed fabric for the body or some stripe fabric for straps. Let us know how you get on, we would love to hear from you!